As it turns out, the guy who wrote the piece on the “not-so-secret” use of analytics by the Sault Ste. Marie Greyhounds was a former TLN Managing Editor, a guy who’s now employed by the Leafs: Cam Charron. Funny how that ends up working out. I won’t forget that lead for two reasons. The first reason is the sheer boldness of buying everyone the same book. It’s basically saying “I’m the boss now, this is your homework, this is how we’re going to do things now.” It’s an audacious power move for a movement that hadn’t really taken full flight in hockey just yet. The second reason is simply because of the title: The Extra 2%. I haven’t read the book, mostly because I don’t read many books, but I’ve always wanted to give this one a read and haven’t gotten around to it yet. But just the title alone is such a striking exposition of the analytics movement in just four words. It’s about gaining an edge on your competition, anywhere you can get an edge. It’s such a competitive field that you can’t expect huge leaps and bounds, but just that extra two percent at every margin and inefficiency available makes all the difference. When someone asks me why analytics matter this is what I think about. I think about finding an edge, an inefficiency, an improvement over the ways of traditional thinking. If you’re not always trying to move forward, you’ll be left behind. At it’s very core, analytics is about questioning the way things are done, why they are done that way, and if there’s a better way to do it. It’s about finding the extra two percent. That brings us to the Leafs. When Brendan Shanahan was brought in as President of the team, everything changed in Toronto and it’s this exact philosophy that changed it. He tore everything down, he brought in smart people, leaders, people that will challenge the status quo. There’s no doubt in my mind that every single person in the Leafs front office is doing what they can to find that extra two percent. That’s why it’s so frustrating to see some things that are happening on the ice. I want to give them the benefit of the doubt, but there’s times where it’s hard to justify the personnel decisions being made based on the data we have. Maybe there’s something unavailable to the public that justifies their value as it’s likely the team has is far ahead of what’s currently available, but while that’s something we can rightly assume, we can’t exactly throw up our hands and bow to their authority either. That’s especially true when the decisions appear to harken back to traditional ways of thinking over something more progressive. Here’s what I mean. Traditionally speaking, we all know what role a fourth line and bottom pairing play. They don’t usually do much and their job is basically “don’t get scored on, we don’t care about offence with you guys out there, just shut the other team down.” And while they may be effective at slowing the game down, they’re completely ineffective because they’re only focusing on one area of the ice. The goal it to out-score the other team, both ends of the ice are valuable. To focus on one doesn’t make much sense. You hear the complaint about offensive-minded players needing to find a “200 foot game” but rarely will you hear that about some fourth line pluggers or shutdown d-men. In the Leafs case, their biggest problem this season has been their fourth line and bottom pairing. Specifically four players: Matt Martin, Ben Smith, Roman Polak and Matt Hunwick. I’m going to immediately throw Martin’s name out of here because he’s got term and $2.5 million per year so he’s not going anywhere. On the surface, it’s a terrible deal that isn’t remotely paying off, but maybe they know something we don’t about him so, again, benefit of the doubt. (To be honest, I just don’t want to keep talking about Martin). That leaves us with the other three, all of whom are below replacement level players. They provide negative overall value to the team, but because they fill some sort of traditional role they have a spot in the starting lineup. Now, if the Leafs had no one else to play I would understand, but that’s not the case. Peter Holland is sitting in the press box for eternity while Ben Smith wins some faceoffs. That shouldn’t be happening. Even if you hate Holland, there’s a number of guys on the first place farm team that are much better than Smith. 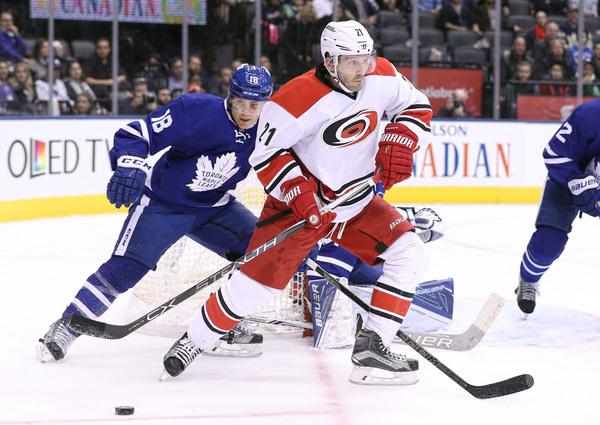 On defence, Frank Corrado has played all of one game this season while Martin Marincin was recently scratched so that the Polak-Hunwick shutdown duo could both play. Both of them haven’t been great this year, but the two combined have been an unmitigated disaster. And yet, these three seem to get a very long leash to iron out their deficiencies while the other three get a very short one and get benched at their first mistake. Maybe it has something to do with effort level, but it’s no wonder those three look like they’re trying so hard; they’re always chasing the game. That’s not the case for the press box guys. I get the sentiment, but it’s missing the point. No one is arguing that Holland, Marincin, or Corrado are anything special. They’re not great players. Everyone knows that. But they are serviceable players, and that’s not something you can really say about Smith, Hunwick, or Polak. This isn’t a call to arms because good players are getting scratched, it’s because worse players are playing instead. But the worst part of the argument isn’t that one, it’s the second part: the idea that fourth lines and bottom pairings don’t matter and it goes back to the extra two percent. Every. Single. Lineup. Spot. Matters. It may be just ten minutes per night, but it’s ten minutes where you can be better than you are right now and perhaps better than the other team. With the Leafs current lineup – the one with Smith, Hunwick, Polak – their expected true talent (based on my model which I’ve talked about previously) win percentage is .484, an 89 point team. Sub in Holland, Marincin, and Corrado and the Leafs are a true talent .505 team, or a 93 point team. Those guys are the difference between winning 48.4 percent of your games and 50.5 percent of your games. It’s the extra two percent. While I’ll admit some roster moves the Leafs have made would leave some scratching their head, people should not be overly concerned with such moves. Why should anybody really care at this point? The Leafs have stated they are in a rebuild and we are currently in year two. Maybe having Hunwick, Polak and Smith on the roster has something to do with the expansion draft, trade deadline, or just making sure the Leafs don’t get good too fast. Whatever the strategy of the Leafs brain trust, it shouldn’t matter in the here and now. Leaf fan’s main focus should be on the core players presently, and certain key prospects. Hunwick, Polak, and Smith is insignificant in the greater sense of the rebuild and therefore, in my opinion, is not enough evidence to discount the process. The Leafs aren’t in Year Two. Just because the team finally admitted they were bad before the start of last year doesn’t mean that they’re in the second year of the replenishment stage. The team has been drafting in the Top 10 since 2013/14. You don’t already start a rebuild with Nylander and Marner. This is Year 4. The team has sucked for a decade, not sure how you come up with 4 years. The dismantling of the team I feel starts the rebuild with Kessel. Shanahan has been around for 3 drafts and the Leafs present brain trust 2 drafts. Whatever timeline you want to use, the dismantling of the team took place last year. Wrong. The rebuild didn’t start with the drafting of players. It starts with a management change or core player change. Teams should always be using the draft to pick good players. Leafs are in year 2 of the rebuild. Worrying about the 4th line now is HILARIOUS! New GMs always mean overhaul and lots of new players, that’s not a good way to define when a rebuild starts. A better way is probably to look at the nature of the trades they’re making, particularly around the trade deadline. I think it started two years ago, in 2014-15. We traded Franson for Leipsic/picks and Winnik (1st time) for picks, a couple more minor deals in the same mould. The year before we were mucking around with the Holland – Blacker+ and the Polak – Gunner deals. So we’re in Year 3, I guess. Not sure why Jeff is nitpicking the rebuild date, I really don’t see the point. At present we’re in a rebuild and roster moves of non-core players is insignificant and shouldn’t even be a concern to Leaf Fans. Presently, I haven’t seen a move by Leaf’s Management that has hurt the team in the rebuild sense. I agree moves during the 2015 trade deadline, should be considered the start of the rebuild. The Kessel trade was the catalyst that signified the teardown. Either way you look at it, these events happened in 2015 and therefore we’re still in the 2nd year of the rebuild. The point is, as the article states, the difference between the two sets of players is only a few wins each season. A few wins is not the difference between a playoff spot and a top 5 pick (well, a lottery win notwithstanding…). If the core of this team (Matthews, Nylander, Marner, JVR, Rielly, Anderson, etc.) fail this year and result a 4-10 pick, a few wins only really amounts to a few picks difference which doesn’t really mean much in the grand scheme. After the top 4 or so (or even the top 2 most years) the difference between picks 4-10 isn’t really that big as you often see in the variability of the pre-draft rankings. HOWEVER, if the Leafs surprise and are a bubble team, a few extra wins can make a HUGE difference. A huge difference in what sense. Are the Leafs a cup contender? A huge difference in making the playoffs. Any team can win the Stanley Cup, sure, but I doubt they would in their first year. How many recent winners have you seen make the playoffs the year before their win and make a deep run before hitting the wall? Even the recent big contenders have done that. Washington for years have been had 1st round exits. San Jose. St. Louis. They all did it for years. Are they not realistic contenders now? They’ve gotten over the hump now and should all challenge. The earlier this core becomes a perennial playoff team, the sooner we are able to make it over the hump to be perennial playoff CONTENDERS. Got to run now, but will be back later this afternoon to keep discussion going. While I agree experience is key to the growth of our rookies and making the playoff would be a HUGE benefit, my concern is to mostly to stay the course and not force personnel moves (via trades) that could damage the rebuild. This year is different because we have an expansion draft to contend with. I’m not sure what strategies playoff/nonplayoff GM’s will implement to give themselves an edge, while protecting personnel for the expansion draft. In the Leaf’s case, they are nowhere near cup contenders, and while they might be a bubble team, I feel these concerns are currently playing their part in roster moves presently. Forgetting Ws today for a second, let’s not throw away the idea of building our own depth to complement the core, something that could happen with players like Holland, Marincin, Corrado, etc. That can’t really happen with Smith, Hunwick and Polak given their age and track records. Ben, I totally agree with your statement but as the writer stated why is Babcock not playing these guys. The answer to the question is unknown. I suggested the strategy may lie in setting up certain situation that have to do with trade deadline, expansion draft or maybe Babcock doesn’t like them. Whatever the reason, I feel it’s insignificant in the great sense of the rebuild. I think the answer is simple. you can’t just throw a bunch of rookies together and expect them to learn to win games. You end up being the Edmonton Oilers. I don’t think trading a 3rd pairing D is when the rebuild started. If anything it was the Kessel deal. We’re in the 2nd year of our rebuild. Nitpick the trades as you like, they were all NHL players for picks/prospects. You are definitively looking at the future when you’re making those deals. Looking at the future is day to day operations. Leafs werent making the playoffs and franson was a soon to be FA. That is how you maximize your assets. We are talking a REBUILD. Just because you say it five times doesn’t make it so. 2nd year. So you need to trade star players to be considered in a rebuild? Ok, got it. The 2015 draft is part of 2015/2016. One of those picks was Kessel. The fact they traded away pending UFA’s is not news. They traded a pick AWAY after they traded Franson and got Marincin and Ross. Trading away Kessel signaled the rebuild. They only traded him so hastily because they wanted a draft pick the next year. It wasn’t going to be a simple retooling. Leafs acquired 12 picks from Kessel on and only 5 the previous year before Kessel. I get what you’re saying in that the wheels were in motion that something was going to change but we really had no idea what extent that was going to be. Shanahan said he was going to make decisions at year end. They didn’t even have a GM. There are enough statements that are objectively wrong in here that I’ll respond one more time. The Kessel deal happened after the 2015 draft. Those 9 picks were from the preceding season and draft day deals. You don’t get those picks by sitting on your hands during the previous season. Trading a 4th rounder and an SPC dump for a 23 yo defenceman can still be part of a rebuild. Having a possible 10 picks in that draft even further drives my point home. Look, I get what you’re saying and superficially it does seem like last year was the first year they were actively looking towards the future and ‘re-building’. But the year before they grabbed a new director of player personel (Hunter) and AGM (Dubas), fired Carlyle mid-season, put in an interim head coach and really did everything they could to grab draft picks and prospects. They were re-building two years ago, plain and simple. He explained in the article that it did matter and you immediately responded that it didn’t using the exact reasons he said people have been using. Because the 2% he’s talking about is insignificant in the greater sense of the rebuilt. I also stated, I agree with the writer in reference to there being better options available to the Leafs, but I have no clue why they don’t use them. It could be part of a strategy we’re not aware of. Since Shanahan took over, I’ve only seen good thing in the way the Leafs handle their business. As a Leaf fan my focus is on the youth not on players that won’t be here in a year or two. The only wrench I’ll throw into this is…. if Polak and Hunwick sit out who are your 4 PK D Men? The PK doesn’t seem like a stumbling block, Corrado and Marincin would replace them, naturally. While we’re at it let’s get Gardiner out there instead of Rielly. With Corrado and Marincin you would be giving up two goals a game, with no offensive output to make up for it. The four games before last night with Polak in the lineup the Leafs gave up less than two goals a game. Last night they took him out and gave up four. Corrado has played one game this year, so your numbers seem made up. But I do hate Hunwick more than Polak so I’ll give you that. If Marincin played full time for Hunwick, I’d call it even. Corrado had a minus 12 after 39 games last year. Over a 82 game schedule that would come in around minus 28 for the year. The Leafs were kind of bad at the end of last year when Corrado finally played. I don’t think that solely falls on Corrado. Plus/minus is a crap stat to assess a guy on especially given how, in a previous post, I think you agreed with someone who called it more of a “team stat”. He had terrible numbers playing sheltered minutes. Corrado is a plug. Mind boggling how much couch sitters think they know about these players better than the coach. I understand plus minus is a stat for the five players on the ice. I understand the stat may or may not mean one particular person is responsible. Still when the numbers get up over 20 it should be considered. What I find annoying is the constant second guessing of why Babcock doesn’t have him in the line up. Babcock has now seen Corrado for over a year. If anything Babcock’s teams are known for the defensive abilities. I have watched him. He is a good skater but unable to skate the puck out of the zone. I watched him closely last year. He doesn’t see the breakout pass very well. When he get the puck in our end he can’t see an open forward so he bounces the puck off the boards to the neutral zone and the other team D, then they come back at us. When he does make the breakout pass it is often right on the stick of the other guys. He has no physical presence. He has a hard shot but can not get it through a screen on net. Babcock rates him as our 8th best D-man. As I said the other day Corrado looked like he worked hard over the summer to improve his overall game. The fact that he is still on the roster is proof Babcock feels he still has some potential. What:s with the constant ragging on Polak, Hunwick in every article I read here.. Most every team has bottom six defenders who people wish were top four. We did the same thing with Phaneuf, l. When management finally did trade him the Leafs were able to slide into 30th place, with Corrado and Holland getting plenty of ice time. Now it seems we are desperately looking for a defenceman. I appreciate the in game analysis and respect your observations on him. Others may feel that Hunwick and Polak have no redeemable assets. I am not one of them. I just feel that Corrado should get a chance is all. He is relatively young after all and should get a chance to show us he can improve. Not in the top 4, just as a semi-regular replacement in the 5-6 slot. Will I be sad if he is gone next year? Nah. I just feel it is good roster management to give the other guys a rest every few games and to not submarine a guy’s value at such a young age. Tampa Bay finished 14th out of 15 teams last year. Arizona has a bright young GM who uses analytics. He has managed to get the team into 30th overall. What I have learned from this article is we no longer need checking lines. The old tradition of half the game is stopping the other team from scoring is no longer valid. Forget about signing players who can win faceoffs. Forget about the penalty kill. Forget about having players who can hold on to leads at the end of the game.Analytics say….Run and Gun, And it works as long as you have Gretzky, Messier, and Coffey in the line up. Come on brother Luke just stop it now. Using rationality just confuses them. I didn’t mention the fact that when Kyle Dubas ran the Sault Ste. Marie Greyhounds they always had a great regular season, featuring lots of speed and skill. They also took an early exit every year in the OHL playoffs. Shot suppression, aka checking, actually does have numbers-driven value on the PK (obviously) and when holding a lead. Sorry to burst your bubble haha. You may be on to something there. I think if you could stop the opposition from getting any shots on goal then you would only have to worry about your own guys accidentally putting one in your own net. Arizona is a budget team, and John Chayka was hired only 7 months ago. Come on. Any players he picked are only still in the OHL. A little early… no wait… way too early to criticize. I’m not even sure where you pulled Tampa from. Tampa finished 2nd in the Atlantic Division with 97 points in 2015/16. That was after considerable injuries and down years from guys like Palat and Johnson. They are also a budget team, FYI. If you want to use them as a run-and-gun example team, how about Pittsburgh? Four lines of scorers. Remind me. How did they make out? Using Gretzky, Messier, and Coffey is a horrible example. I’m pretty sure a lot of teams played that way back then and were fairly competitive. I was just looking at an unrelated thing but goalies were winning Vezina’s with 0.905 save percentages back then. Their S% weren’t that low solely because of the few times they played Edmonton. The point is you can have a fourth line that plays competent defense AND can contribute a bit offensively. The best way to play defense is to keep the puck the farthest you can away from the net (except if you have Toskala…). Arizona’s projected cap hit is 2 million more than Toronto. ya… except bolland, pronger and datsyuk aren’t getting paid by the team…. so take 18 mill of taken up cap space off the actual books. Yah we know all this from many many articles before. I think like a few of the other commenters that for right now in approximately year 2 of rebuild or I might even say year one in terms of the NHL product, its hard to get too carried away with the 4th liners or bottom defence. I believe most of us are aware of their short comings and generally believe that in the coming years these players will be moved on and replaced by better players from within or the organization, including the Hollands and Corrados of the world. Generally the only defenceman outside the top three I have any hope in is Carrick. As for the 4th line well they’re passable and shosh has some promise. Jonah Keri’s book is great you should definitely read it. I plan to just do that. I do find it a bit strange that the author of this article hasn’t taken the time to read a book which in reality he is writing about. to be honest it’s about baseball, not a whole lot of applicability outside of the very basic idea of statistical analysis. Don’t think reading the book would have made a difference at all to this article. No it’s peculiar alright. The writer not only has not read the book he references, he actually confesses to not reading much at all. I’m not taking my mechanic to someone who doesn’t drive and I’m not giving this dude any more of my time. That’s such a painfully bad analogy. Reading books has no bearing upon someones ability to write articles. It’s not like he doesn’t read anything. Also the fact that he’s confessing it is bad? You’d prefer him to be dishonest about his credentials? Honestly? You’d prefer him to pretend that he has read a book that he hasn’t read? And that one tiny bit of this otherwise very well written and thought out article is the reason you aren’t going to continue to read the work he puts out? You really ought to reconsider the beliefs you have about the world, and the way you go about making decisions. Are you suggesting that we should fire dubas for bringing in grit grinders on the bottom pairing? According to one analytics site, Polak & Hunwick, when together this season have a GA per 60 mins of 1.40. That doesn’t sound like a disaster to me. Hunwick’s plus/minus is zero. Polack’s is minus 3.same as Reilly’s.